I was on the hunt for a special sort of dinner tonight, and was trying to steer clear of beef or filets since I made Beef Wellington last Friday night. I was stumped, so I pulled up my 100 List to see if anything on there could provide some inspiration. As I browsing I saw fettuccine alfredo, which is one of my favorite dishes to eat when out to a restaurant, and also something that I have yet to master at home. Sweet, I had my dinner! Then on my list I saw “homemade noodles”… hmmm… That sure would make fettuccine alfredo infinitely better, would it not? This was an absolutely delicious dinner – I might be officially addicted to fresh homemade pasta, and this alfredo sauce was just perfect! Growing up eating authentic Italian dinners at my grandma’s each Sunday, the notion of fresh pasta is not something that is inherently new to me, but it’s been quite a long time since I’ve had it and this was the first time that I actually made it myself. I did make gnocchi back in the winter that was absolutely wonderful, but of course those dumplings are much different than actual noodles. All told, it took me about one hour to make the pasta dough, roll the sheets, and cut the noodles. A small investment for something so good, in my opinion. I am including the recipe quantities that I used – I would say they were enough to feed two adults if you are into portion control. The next time I make this I will double the pasta and probably do 2.5x the sauce recipe. It would allow for some leftovers as well. I am planning to do a process post on making fresh pasta in the near future, so be on the lookout for that, as there will be a lot of detailed pictures! There's nothing quite like fresh pasta! 1. To make the Fresh Pasta: First make a mountain of flour on your work surface, then create a crater in the center (err on the larger size when creating the crater). Add your eggs in the crater. Use a fork and beat the eggs in the crater incorporating a little bit of the flour at a time. Once the egg mixture begins to look like a batter, you can start incorporating more of the flour into the dough. After incorporating all the flour, you will end up with a dough. If the dough is still sticky, add some more flour. Knead by pushing with the heel of your palm, fold the dough in half, give it a half turn, and repeat the process for 8 minutes or until it feels smooth. 2. Have 1 or 2 parchment-line baking sheets or trays ready. Divide the dough in half. Keep one half on the floured surface, covered iwth a kitchen towel to prevent it from drying out. Before handling the dough, dust your hands, the machine, any accessories and the baking sheet with flour. Lightly flour the work surface. Using a rolling pin, flatten the dough into a rectangle thin enough to go through the rollers at the widest setting (#1 on my pasta machine). Feed the dough through the rollers while turning the handle, then lay the dough down on the work surface and flour it lightly. Fold the dough into thirds lengthwise to make a rectangle and lightly flour both sides. Flatten the dough with the rolling pin until it is thin enough to go through the rollers again. With one of the two open edges going first, pass the dough through the rollers nine times more at the widest setting; after each time, flour, fold and flatten the dough. After 10 trips through the wide rollers, the dough should be completely smooth and supple. 3. Now you are ready to thin the dough. Starting at the second-to-widest setting (#2), pass the dough repeatedly through the rollers, setting the rollers one notch narrower each time. When the dough becomes too long, cut it in half and roll one piece at a time until it reaches the desired thickness (my pasta maker has 6 settings, and for the fettuccine I rolled the pasta sheets to the second thinnest setting, #5). 4. Dust the baking sheets with flour, arrange the rolled out pasta sheets on the baking sheet, separating each layer with parchment and dusting with flour as needed. Cover with kitchen towels to prevent them from drying out. Repeat the entire process with the other half of the dough. 5. Wrap the tray of pasta with plastic wrap, making sure that it is completely sealed to prevent drying out. Let the pasta rest for at least 10 minutes before cutting so that it is not too soft. 6. Before cutting the pasta sheets, line a baking sheet or wide, shallow container with parchment paper and dust with flour. Keep additional flour nearby for dusting. 7. Feed the pasta sheets one at a time through the cutting attachment. Dust the pasta evenly but lightly with flour. Gently father the pasta together lengthwise in a bundle, dust with flour, and carefully twist and shape it into a small, nested mound. Transfer the pasta to the prepared baking sheet or container and dust the top lightly with flour. Repeat with the remaining pasta sheets. 8. If not cooking the pasta immediately, cover it tightly with plastic wrap. Refrigerate up to 3 days or freeze up to 1 month. 9. Bring a pot of water to a boil, drizzle some olive oil into the water, then add the pasta. Cook for 1 1/2 - 2 minutes or until the pasta is al dente. Drain the pasta. 10. To make the Alfredo Sauce: Simmer the cream and butter in a saucepan over low heat until it has slightly thickened, about 5 minutes. Add the cheese, remove from heat, and stir until mostly incorporated and melted. Add freshly ground black pepper and salt to taste. Toss with pasta. Hello. 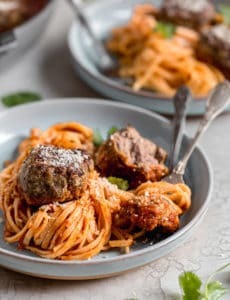 It seems that there is meat in your pasta as well according to the picture you’ve posted but I don’t see it anywhere in the recipe? Hi Rida, I added chicken to the finished dish. Pasta is a favorite in our house, my daughter would eat it everyday of the week if she could. I think this recipe for fresh pasta might be something we do together. :) Thank you again for the recipe Michelle. 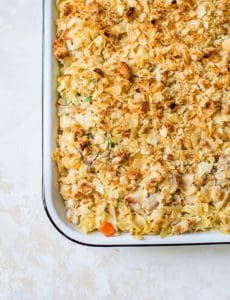 This recipe looks soooo good, but i dont have a pasta maker or stand mixer. Can I make it any other way? Hi Rebecca, It’s hard to get the dough rolled out that thin with just a rolling pin, but if you have the patience for it, you could definitely do it! Then just use a pizza cutter or sharp knife to cut the noodles. How many servings will this make??? Hi Enas, This is enough for about 2 adults. I recently ate a delicious Vegetable Roulade while on a trip to Salt Lake City. It has artichokes, mushrooms and spinach in an herbed cream cheese sauce rolled in a sheet of fresh pasta and topped with marinara, parmesan and mozzarella. It was so good that I decided I want to find a recipe for it and make it at home. I am getting ready to buy a pasta maker so I can make the pasta sheet but haven’t yet found a suitable recipe – I may have to wing it. Definitely gonna use this pasta recipe. I am interested in trying out this sauce recipe. I have a killer recipe that I incorporate a few tablespoons of cream cheese into the butter and then add my cream and reduce…I’d like to see if this makes for a much easier recipe that is just as tasty! Your photo looks heavenly. 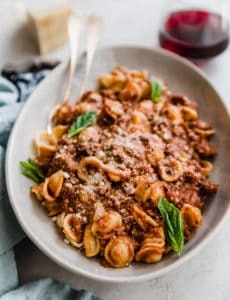 I haven’t made homemade pasta yet, after looking at your photo here, i definitely want to give it a try soon! This looks wonderful. I am very jealous of the fresh pasta. I will have to try and follow your instructions sometime! Wow, I am craving alfredo like you would not believe! This looks so seriously good I want to lick my screen. I started Al Dente Pasta Company for people who definitely wanted a pasta that tasted exactly like fresh homemade pasta, even cooking in just 3 minutes, but did not always have time to make it. Please try it with your Fettuccine Alfredo sauce and let me know what you think. http://www.aldentepasta.com if it’s not available in your local store. YUM! I’ve never made homemade pasta before. I’m totally impressed! Awesome job. 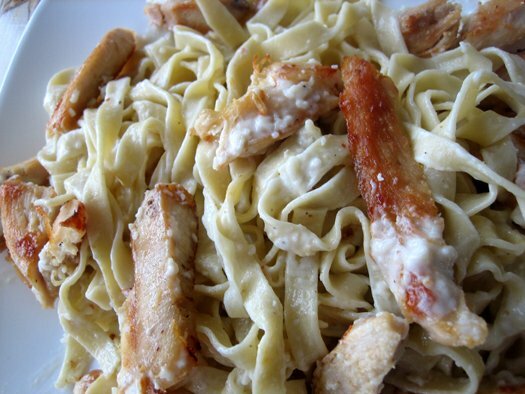 Looks awesome – the alfredo sauce can be tricky to make and yours came out beautifully! I made fresh pasta once and it was so good… I need to do it again! It’s only 8:45 in the morning, but I think I could eat a bowl of this right about now. Looks wonderful! you have me DROOLING here! i love alfredo sauce! i’ve never made homemade noodles , i can’t wait to see your post about it. absolutely a great dinner!! I agree that the time spent making fresh pasta is well worth the taste.